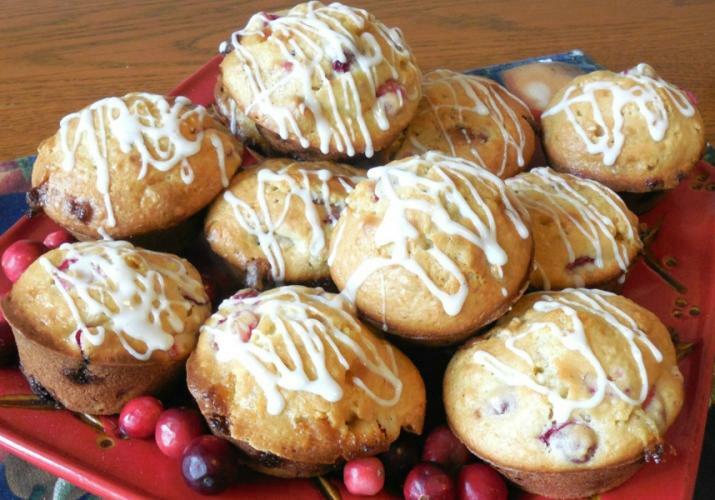 These cranberry muffins will quickly become one of your favorite recipes. My family loves anything with cranberries and we eat them all year. We like them in salads, desserts, muffins and we even like the cranberry sauce in the can. These muffins are wonderful with coffee or milk for breakfast or a snack anytime. They are wonderful to serve your guests and family during the holidays. The chocolate chips really add to the flavor of these muffins and the cranberries are so pretty. You can just sprinkle these with powdered sugar, add the glaze below or leave plain. We like them with the glaze. I have not tried them with frozen cranberries but see no reason why you could not use the frozen ones. These muffins keep well for several days and can be reheated in the microwave. I keep them in a plastic container in the fridge.